Arp 147 contains a spiral galaxy (right) that collided with an elliptical galaxy (left), triggering a wave of star formation. Many of these newly-born massive stars raced through their lives and ended with supernova explosions, some as black holes. 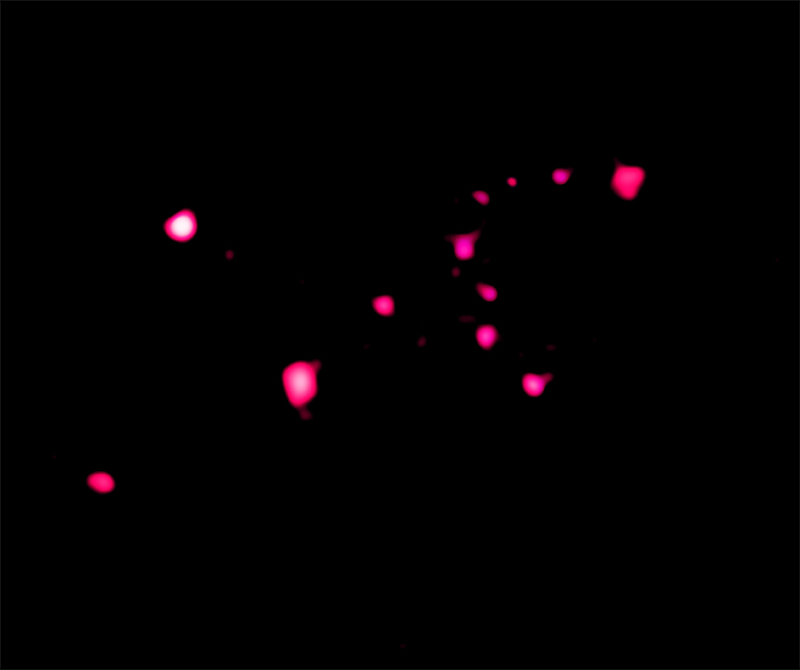 A ring of these black holes can be seen in the Chandra data (pink) around the spiral galaxy. Infrared observations with NASA's Spitzer Space Telescope and ultraviolet observations with NASA's Galaxy Evolution Explorer (GALEX) have allowed estimates of the rate of star formation in the ring. These estimates, combined with the use of models for the evolution of binary stars have allowed the authors to conclude that the most intense star formation may have ended some 15 million years ago, in Earth's time frame. These results were published in the October 1st, 2010 issue of The Astrophysical Journal. The authors were Saul Rappaport and Alan Levine from the Massachusetts Institute of Technology, David Pooley from Eureka Scientific and Benjamin Steinhorn, also from MIT. Coordinates (J2000) RA 03h 11m 18.9s | Dec +01° 18´ 52.99"
That is the future of the Milky Way. Andromeda galaxies when they collide in four billion years. Ultimately they will merge into one big galaxy. In the above pictures, the two galaxies will also probably merge together as one galaxy. Really great, amazing views of galaxies and parts of the universe. So very amazing. Great explanations of x-ray information, along with images of other wavelengths. Wonderful. Thank you. Very beautiful! I love space. We are a part of it. Congratulations to NASA, further success. Introspective viewpoints are a challenge to define, perhaps like the elements of space, to locate a viewpoint and understand it from our own limitations. Oh my god, these images are so beautiful. I love NASA. 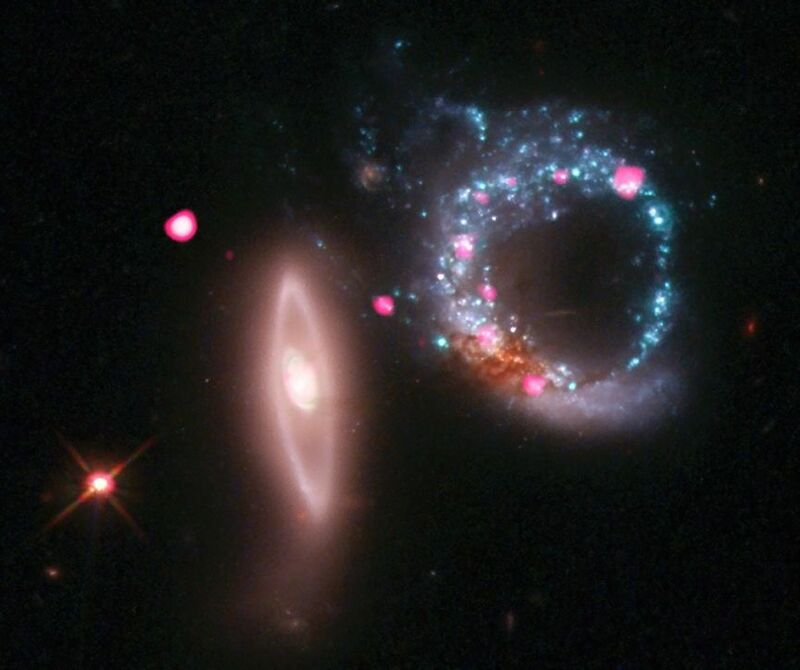 If possible, I would like to have a picture of the distribution of "dark matter" after the collision of these two galaxy. Hello, would you be able to compile photos of the poles of the sun and see any periodocity? and can you see any size diameter variations? can you see a harmonic? Wow. It seems like there would be a heart-like figure inside the right galaxy. The universe never ceases to amaze. Galaxy mergers and "collisions" also interactions have always fascinated me. This particular one is one of the most beautiful. Has the elliptical passed through the spiral galaxy? That is what seems to have happened, just my own guess on the matter. Many forces at work here. Wow, no words to describe the beauty, it's just felt. I really love to collect images from NASA. These are truly wonderful and amazing. I love NASA. These photo in x-ray shows to us at least 3 black holes and the cone deep form, for elliptical galaxy a massive black hole in center. A massive Black hole, can be create to the neighbor galaxy, it don't only depend of the accretion mass disk of a galaxy but really of the type of star. A pair of interacting galaxies. About 430 million light years from Earth. About 115,000 light years across. X-rays are magenta and the optical data are red, green and blue. In the constellation Cetus, visible in the Northern Hemisphere.